Babies and road trips don’t always mix well. Travelling is stressful enough, but when you add an infant into the equation, it can quickly turn into a nightmare. If you’re planning on taking a road trip with your little one this year, here you’ll discover the best advice and tips to help turn it into a stress-free, or at least a significantly stress-reduced, experience. 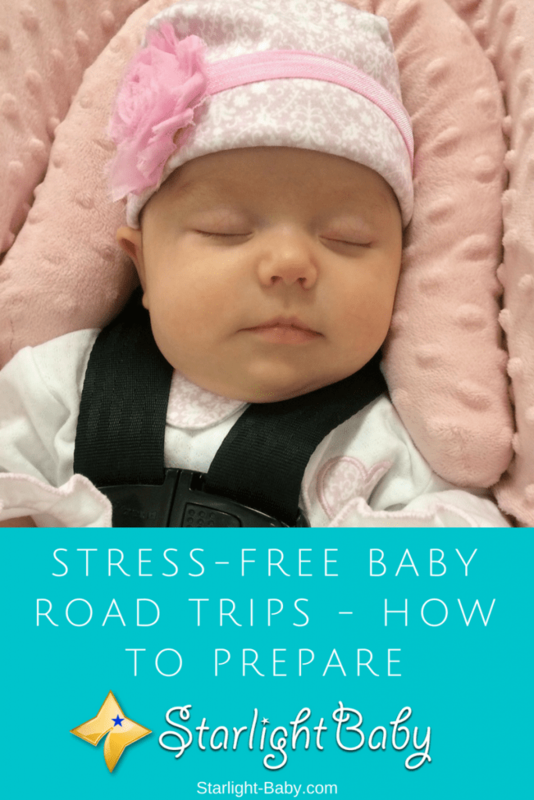 You want to know the secret to a stress-free baby road trip? Planning! We’re not just talking about planning your route here. We’re talking planning nap times, stop-offs, feeding times, potential delays, distraction techniques and safety equipment. You need to think about every potential scenario that could occur and then plan what you’re going to do if it happens. If your baby tends to sleep in the car, plan to set off when they’re due for nap time. Don’t fool yourself into thinking a fussy baby will be forced to sleep if they’re tired once they’re in the car seat. Not only is this untrue, but it’s also going to lead to a massive baby meltdown, which isn’t fun when you’re all locked in a car together! So, don’t delay nap time thinking it might help, instead plan to set off right after baby wakes up from a nap. If you’re heading on a long road trip, consider breaking it down. Even the most well-behaved babies will get frustrated being strapped into a car seat for hours on end. Breaking down the trip will reduce the chances of your little one becoming fussy and it will also help you to clear your own mind. The last thing you need is to be halfway into your journey, only for something to go wrong with the car. Have it serviced before you set off to ensure it’s not going to spontaneously break down on you. You’re also going to want to ensure you’ve got everything you need. This includes plenty of spare diapers, snacks, gas and a well-fitted rear car seat. Making sure the car is prepared will give you additional peace of mind and make the trip run a lot smoother. It’s a good idea to load the car with everything you need the night before the trip. In your excitement and keenness to get going, it’s easy to forget something on the day. Don’t make the mistake of packing everything into the trunk. Keep plenty of toys, snacks and distractions right there in the car with you. When distractions are needed, they’re often needed quickly so there often isn’t enough time for you to pull over and get what you need. There’s also the risk you won’t be able to pull over when you need baby’s toys and accessories. Nothing distracts a baby like a new toy to play with. So, as well as packing their favorite toy to play with in the car, consider buying a few new ones to tempt them with during the trip. Baby books are potentially one of the best options if there are other passengers in the car. Adults and siblings can read the books to baby, keeping them distracted for a long time! Don’t forget about yourself either. Driving for long periods of time can be frustrating and stressful, especially if your baby does decide to have a meltdown (or five!) Audio books are a great way to relax and unwind when baby is sleeping. The sound of the voiceover on the book may also encourage your little one to sleep better. You can also get creative. Taping some really bright colored pictures to the car in baby’s view can help to keep them happy. Similarly, you can use yarn or ribbon to secure your baby’s lightweight toys, such as stuffed animals, to hang them like a little mobile. If the toys start to fail to hold your baby’s interest, try a snack. Don’t let them get too hungry either as this will result in a very unhappy baby. Make sure you’ve planned ahead for feeding times and don’t be tempted to delay them, even if baby is quiet and content when the feed is due. Now this tip is only going to work if you’re not travelling alone with your little one. If it’s a family road trip, make sure somebody is sitting in the rear with baby. Remember, your baby is strapped into the rear and they cannot see you while you drive. This can be quite distressing for them so being able to see a familiar face can make all of the difference. It’s not easy to relax when you’re travelling with a baby, but as long as you’ve followed the advice above, you’ve got everything you need to help entertain your little one and keep them happy along the way. Relax, breathe and enjoy the trip. The more you dread the experience, the less you’ll enjoy it. See it as a great opportunity to see new things and enjoy this new and exciting experience. Overall, a road trip with baby doesn’t have to be stressful. Just as long as you prepare well in advance, you’ll be able to overcome any potential obstacle and focus on making the most of the trip. Have you got any road trip tips of your own? Do us all a favor and share them down below – we could all learn from what you have to share! In a couple of days, we will be traveling to our ancestral temple in a hill station, which is 4 hours road trip from our home. We are taking the baby with us. Actually we planned this trip for the baby, we want our baby to be blessed by our patron deity. The tips mentioned in this articles will surely come handy to us. In my experience (we have already taken our baby to a road trip in the past), the most important requirement is having a comfortable seat for the baby, where you have a baby seat or place the baby on your lap, the baby should be in comfortable position.